This is what handmade means to us. It's not cranked out of a machine overseas; it starts with a wonderful design and a crude piece of platinum or gold, lovingly fashioned in the hands of a master jeweler. We love recommending the jewelry we make, because we know each step that has gone into its creation: we've watched the platinum melted, hammered out on an anvil and welded into beautiful form. It gives us peace of mind to know everything is as good as it possibly can be. Engagement rings are a special point of pride in our workshop. We build rings to be just as beautiful a hundred years from now as they are today. 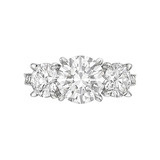 We invite you to learn more by contacting one of our engagement ring specialists by email or at (888) 556-2127.